ELEVATE: We will affirm our relevance and positively affect society. Alpha Sigma Alpha is committed to being an active partner in our current and future campus fraternal and Panhellenic communities. 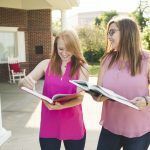 In order to provide relevant programming that will enhance fraternity and sorority communities across the country, Alpha Sigma Alpha offers fraternal enhancement grants to higher educational institutions where Alpha Sigma Alpha has recently established a chapter. The purpose of these grants is to provide funding to the fraternity and sorority community for educational programming. If your campus is home to a newly established Alpha Sigma Alpha chapter, contact the Director of Collegiate Services.